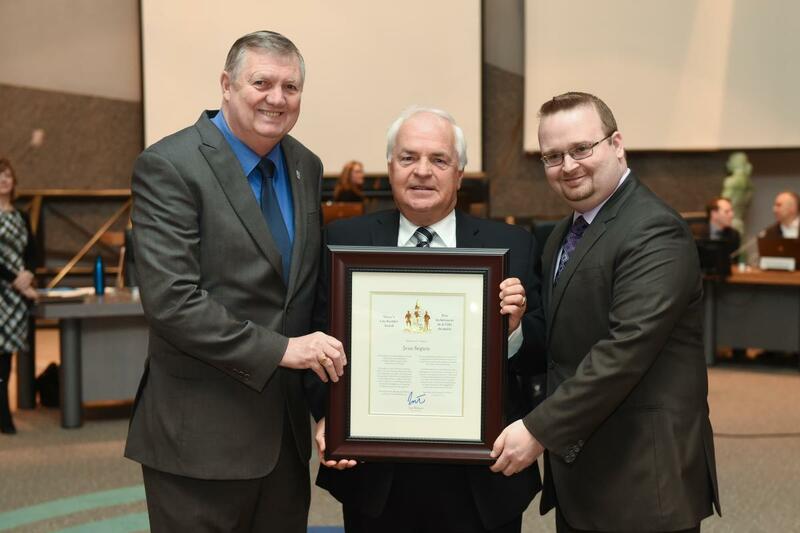 Deputy Mayor Bob Monette and Councillor Stephen Blais presented the Mayor’s City Builder Award to Jean Séguin today in recognition of his many years of leadership and volunteer contributions in the Vars community. From 2006 to 2009, he spearheaded the participation of Vars in the City’s Neighbourhood Planning Initiative pilot project. Many of the programs and projects currently underway in Vars flow from the community plan that was developed during this process. As the immediate past president of the Vars Community Association and a tireless booster of his community, Mr. Séguin volunteers his time and considerable diplomatic talents to initiatives including the Marketmobile, the Vars summer youth camp program, the local rink, the community garden, renewal of the Cenotaph war memorial, and the establishment of a community Christmas sing-along and the lighting of the village Christmas tree. He works with the Anglican and Catholic parishes, French and English service organizations, funding partners from the private sector and at all levels of government, and any benefactor he can find who is willing to help the community to move forward on its priority projects. While Vars has been literally on the map for 130 years (as of 2016), and Mr. Séguin is working on pulling together a history of the community, he also focuses stakeholders on the great future that the village has ahead of it.